Williams Arena is 90 years old. It’s one of the most storied basketball venues in America and a huge part of this state’s sports history. The building’s raised playing floor is unique and a focal point of the arena that opened in 1928. As of this summer that floor has a new look with a gray-white paint job. Included in changes is floor signage more prominently referring to “The Barn,” the building’s nickname. The floor has gone through various looks in the past, and the change now is dramatic. A half century ago the oak floor had a simple gold-like look, with signage limited to a block M in the center jump circle. More recently the floor has been a mix of gold (aged yellow?) and maroon, with the former having the emphasis. 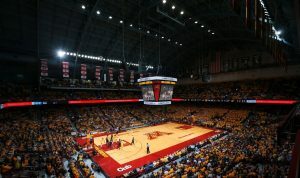 The new coloring’s intent is to provide a “barn replica” appearance, according to Athletic Department spokesman Jake Ricker. Gone is the maroon border that contrasted sharply with the gold. I am warming to the barn look but don’t time me with a stopwatch. Judging by photos, the change appears to create a lighter atmosphere in the arena. However, there is so much history and tradition to Williams Arena that my preference would be the simple oak colored floor of decades ago. To me, that appearance best honors the historic venue on University Avenue. I never have liked references to “The Barn.” The building was named after the great Gopher football coach Dr. Henry Williams. Let’s honor Doc. We’re not rubes with eighth grade educations that play basketball in a barn. Students dressed as barnyard animals? Puh-leeze, not classy. 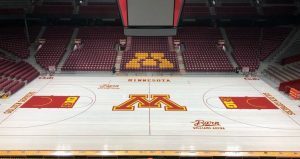 The Williams Arena floor needed renovation this year because of wear and tear. A bunch of folks at the U came up with and approved the design for the floor. It will probably be another seven to 10 years before renovation will be discussed again. Ricker said although few fans have seen the floor yet, positive responses out-number negative. I reached out to more than 20 readers of my column for their take on the new look and “The Barn” nickname. They came back with varied views and emotions, with some reviewers saying they want to reserve final judgment until they can evaluate in person (thumbs up).